Summary (from the back of the book): Northern Uganda, 2002. A country of astonishing beauty in a time of unspeakable brutality. Deep in the bush, far from Western eyes, an insane extremist Christian rebel and his army of brainwashed children terrorize their own people and engage in guerilla warfare against government troops. Into this madness steps Dr. Lwanga Moses. Only seven years old when his family fled the Amin regime for the States, Lwanga has an Ivy League education, a beautiful Ugandan wife and a staunch pacifist philosophy. The embodiment of the American Dream, he has returned to help heal the Northern Ugandan nightmare. 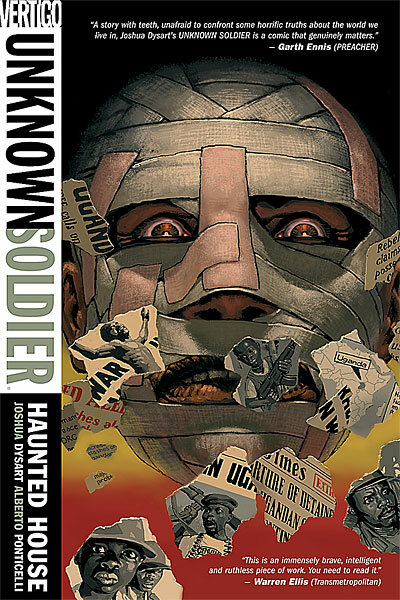 But within the heart of this healer mysteriously erupts an unstoppable killing machine, an unknown soldier. And when he launches his one-man war against the men... and children... who have turned rural Uganda into a war zone, there's no telling who will get caught in the crossfire. Review: I came across this book when I read The Enough Moment last week. 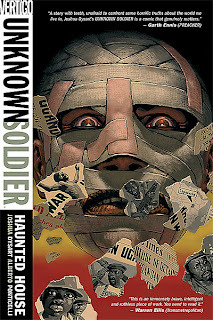 It was hailed as an amazing graphic novel dealing with the Lord's Resistance Army (LRA) in Uganda and the issue of child soldiers. I went to the author's website to find out more about the book. It turns out there are now four volumes, but my local independent bookstore currently only has the first volume. I bought and read this book fully planning on donating it to my school's library. Then I read it. It is so good, but so graphic and so intense. I realize that teenagers today are used to violence from video games and the movies they see, and swear words appear in many books that we have in our school library (let's not forget about Catcher in the Rye!). Maybe it's because this is a graphic novel and the images are right in front of the reader; there is no avoiding the horrifying brutality of the LRA and life for child soldiers in Uganda and elsewhere. Then I chastise myself for thinking of not putting this book in the library's collection: reading a book about it is so much easier than living through these events. To not include it is censorship. To not include it is to say that my school's students shouldn't hear about the horrors that are going on in northern Uganda. So, I will add this book to my library. Now, about this slim volume. The illustrations are phenomenal! 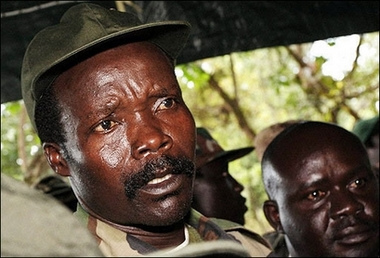 The colors, the details, the gore... it all gives a real sense of what it is like in Joseph Kony's LRA. It is brutal, scary, graphic, and terrifying for all involved. The story itself is wild, based in fact (the child soldiers, the work of NGOs, the terror that the Ugandan people on both sides of the issue suffer, etc), and intense. I definitely want to read the other volumes, but may need to do so with some time in between to give my brain a break from the intensity. I realize how unfair that is that I can take a break from it and the Acholi (the tribe in Uganda) cannot. And that pains me. 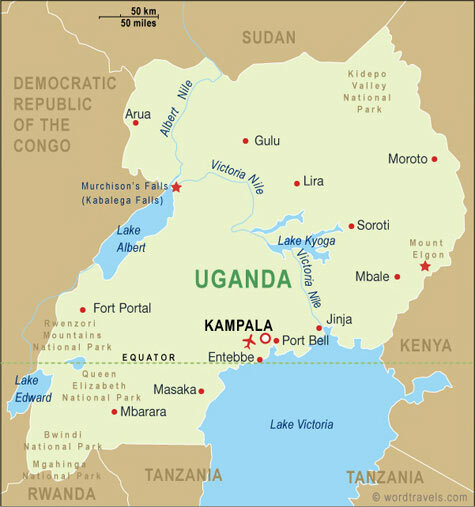 I hope to go to Uganda in the summer of 2012 (in conjunction with seeing the Olympics in London...how's that for a diverse trip?) I plan on visiting schools that have received books through Turn the Page Uganda and I hope to see Breakdance Project Uganda, Voices of Uganda and schools in refugee camps. Click to see my updated Google Map.